Special Surfers is a non-profit organization (501(c)3) that provides the opportunity for people with special needs to surf. There is no cost to participants or their families, and all equipment and instruction is provided. Special Surfer events are held on the third Tuesday of each month in June, July, and August at Gooch’s Beach in Kennebunk, Maine. We have hundreds of special surfers and volunteers at each event providing a real sense of community and accomplishment for all. Who is considered a Special Surfer? Any child or young (at heart) adult that has special needs (physical, mental, or emotional) is welcome to come. Please consult with your doctor if you have concerns. 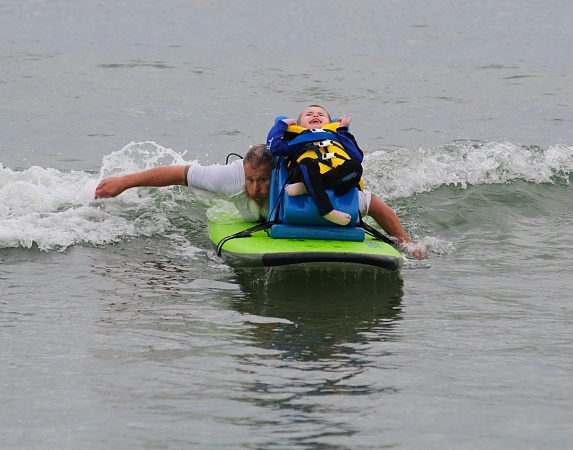 If you feel like your child or young adult is a good candidate, bring us your Special Surfer! Kids and young (and some mature) adults with Special Needs. Often these are people who, in their everyday lives struggle to feel like they fit, like the world has a place for them. When they come for an evening of fun at the beach, it’s all about them. We have no rules, no expectations. We want them to have fun. That’s it. Some of these kids and young adults lead pretty structured and even humdrum lives. Many of their parents dream of enjoying watching their child excel at things average people take for granted. When they come to Special Surfers Night, they watch their children and friends shine. We are families of special needs children and young adults who love to experience things in life that bring joy and excitement. Special Surfers is a lot of things. We are kids. We are surfers. We are smiles. We are free.